First, preheat the oven to 375 degree F. Then grease a standard muffin tin with butter. Then cut both the apples in half. Take a very sharp knife and cut the halves of apples in 1/8-inch thin slices. Then immediately sprinkle lemon juice to prevent browning. Now take butter, sugar, cinnamon and nutmeg in a bowl and toss them. After this microwave the slices for 45 seconds or until soft. Now sprinkle flour on slab and place the puff pastry on it. Roll out into a 9*12-inch rectangle. Cut six 2-inch wide strips of dough. Now, microwave preserve for 30 seconds. Now in a small bowl, combine the preserve with 2 tbsp of water. Spread evenly over each strip of dough. 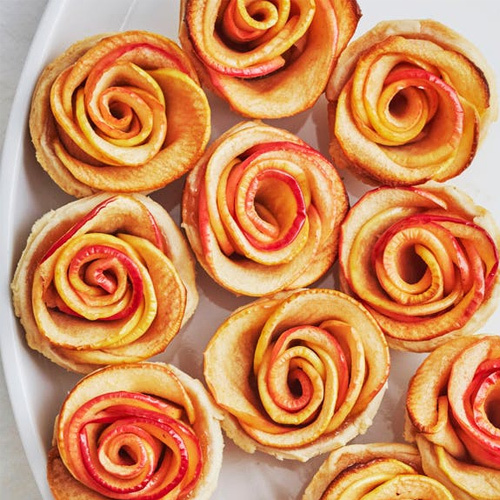 Arrange about 10 apple slices lengthwise in a straight line on a strip of dough, slightly overlapping. Fold up the bottom part of the dough and begin tightly rolling the dough to form the rose shape. Press the edge to seal. Repeat for all the pies and place in the muffin tin. Now bake them for 40 minutes or until they turn golden in colour. The delicious Apple Rose muffins are ready to eat. Garnish them by sprinkling powdered sugar.